Doom Survival Guide Blog: Rising Seas or Sinking Land? Rising Seas or Sinking Land? Sinking land is rarely reported. Coastal land or islands being lost to the ocean are often blamed on rising seas or excessive rain. Strange how the "rising sea" seems to discriminate against certain areas, while changing very little in others. Beaches I have known since childhood, that are so long and flat that the tide rushes in and out over a large distance very quickly, still have the same amount of beach that they had decades ago. Yet, some places have lost enough land to the ocean that they have had to be evacuated after countless centuries of undisturbed habitation. There is a jetty here which is around 800 metres long (1/2 mile). At low tide you need to walk almost the entire length of the jetty to get to water because the beach is on such a gradual incline that there is a vast difference between low and high tide. I haven't lived here forever, but according to long term locals I've asked, they haven't noticed any loss in the amount of beach. Official scientists throw around figures such as 9 mm per year rate of ocean rise. Presumably this is the outcome of measurements, or perhaps results from computer simulations based on CO2 in the atmosphere. Since I don't subscribe to the carbon based climate change theory, I don't really care to investigate. Perhaps there will be more on this dubious "science" in a later blog, but if you want to see what happens when carbon dioxide (which BTW is heavier than air) is released into the atmosphere, this Snopes Article is a good place to start. This post was inspired by This Article which led me to do some further research and expand it a little. Emphasis is added and original opinions are mixed in with sourced information. It's my blog. Sue me. The president of Kiribati, Anote Tong, is in talks with Fiji's military government to buy up to 5,000 acres of land in order to relocate the 102,697 people that live in his country. Other plans considered include building a man made island, similar to a floating offshore oil rig (at a cost of roughly $US 2 billion), or a series of sea walls, costing nearly $US 1 billion. This money will have to come from the international community and is very unlikely to come, as each region on Earth faces their own strife. President Tong tells The Telegraph that this is their last resort: "Our people will have to move as the tides have reached our homes and villages." Most of its population has already relocated to the island of Tarawam, after their home islands vanished. Villagers on Abaiang, one of the Kiribati Islands, had to relocate the entire village of Tebunginako because of rising seas and erosion. The Maldives are fighting a losing battle to keep their heads above the water. Their capital - an area of just 1.77 square kilometres - has a 3 metre wall erected around it in an effort to keep the ocean out and protect the 110,000 people squeezed into this city. 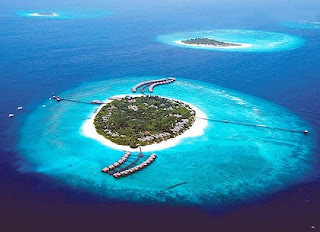 The biggest issue faced by President Nasheed is the loss of their liveable land, so far losing three inhabited islands a year to the ocean. A documentary describes his battle. 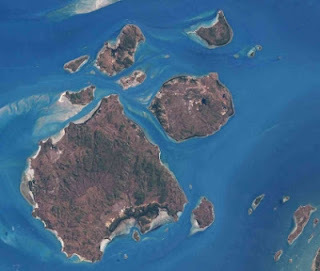 Already 14 of their 200 islands are gone. 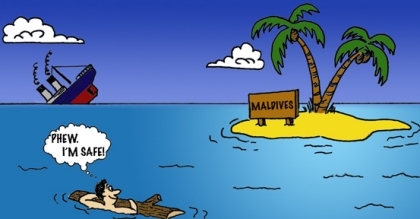 The Maldives was the first nation to sign up to the (worthless IMO) Kyoto protocol. A further 70 islands have had their water aquifers inundated by sea water and their occupants now rely on desalination for their drinking water. Plans are in place to purchase land elsewhere to relocate the population. A very impressive stance from the government there, where they could have just cut and run like so many others in power would do. Other, more extravagant plans, are also being floated - pun intended. 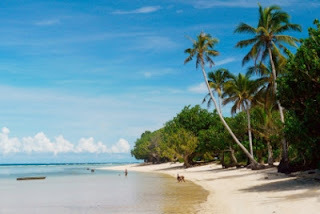 One of the sourced articles reports "A sea-level rise of 59 centimetres over the next century, the upper limit forecast by the Intergovernmental Panel on Climate Change, would render most of the Maldives uninhabitable." 59 centimetres in 100 years ? This seems a little optimistic to me, and a nice example of the "Not in my lifetime" mindset that is so common. 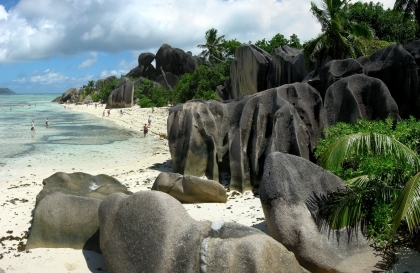 Seychelles is another island losing land to the relentless and unforgiving ocean. Areas that were recently covered with trees are now beaches, the trees toppled by the ever advancing waves. Locals are noticing their beaches shrinking, tourists cramming into smaller and smaller areas as the land continues to disappear beneath the approaching water. So far, 6 islands in the Torres Strait are facing flooding from the ocean. Building foundations and ancestral graves are being washed and eroded away. Roads have disappeared and houses have become permanently flooded. Obvious signs of centuries of undisturbed habitation, now being lost to sudden changes. After generations of living by the sea, many locals are feeling uncomfortable, especially in periods of "king tides". Tidal water is encroaching houses that never used to be at risk until recently. The residents of the island of Tegua, which numbered roughly 100, were declared the world's first climate change refugees by the UN. Torres Shire Mayor Pedro Stephen was quoted to say "These islands are sinking." 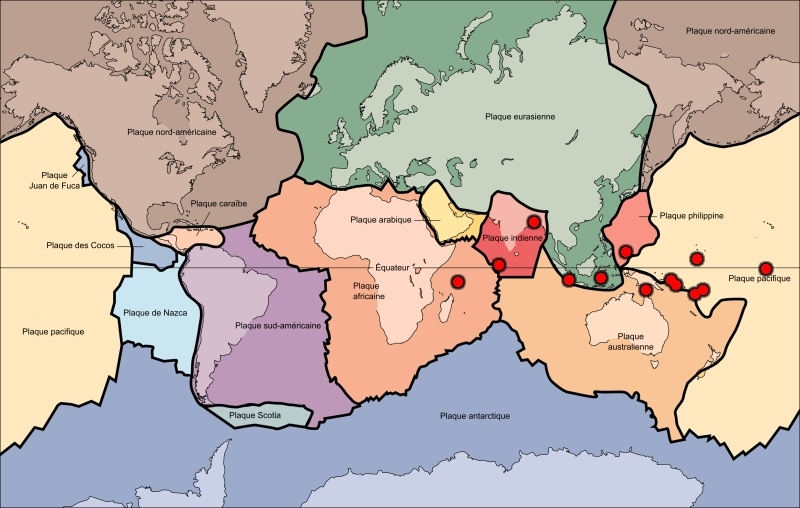 Whether he was referring to actual land subduction is not clear. The federal government has pledged $5 million for funding seawalls on 2 of the islands, however the Executive Manager of Engineering Services reports that this is thoroughly inadequate. 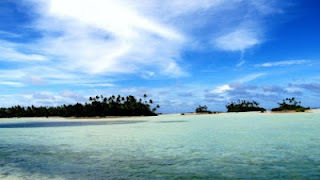 According to Donna Green of the University of New South Wales, the Torres Strait islands - considered the most vulnerable area of Australia, is barely a consideration for the Australian government. $5 million sounds like a lot but does not go very far in large scale building projects, and this money is yet to be delivered. Most governments aren't much use when it comes to anything but taxing the crap out of you. Bangladesh, Indonesia and Jakarta deserve blogs in their own right, and may be expanded upon here at a later stage. Just out of interest, I plotted the locations of these places against a map showing the major tectonic plates. There certainly seems to be a clustering. Make of that what you will.